When is a smoothie more than a smoothie? When it's a lassi, of course! I always order a mango lassi at Indian restaurants. But they're dead simple to make at home. I've given a little spin to the recipe, to capitalize on the beautiful jar of Vermont Maple Syrup I made off with from the farmers market. While not traditional, neither am I, so this lassi and I have that in common. The other thing we have in common is that you're sure to enjoy our company. You do enjoy our company, don't you?! Chuck it all into a blender and, well, blend. Drink. Smile. I love mango lassi, the addition of maple syrup is intriguing. Your mango lassi looks great. I usually sweeten mine with honey. 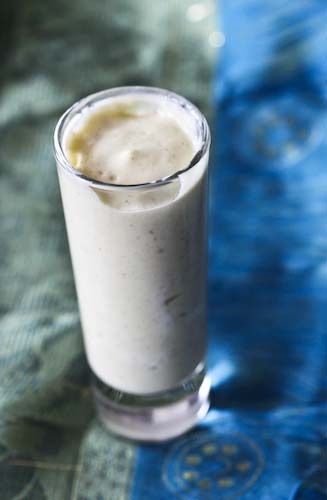 Your lassi looks great! Maple syrup is an interesting sweetener! My husband would go nuts if I made this for him! Manog with maple syrup, this sounds awesome!! Great combo!! I've always wondered about these drinks at my favorite Indian restaurant. Sounds too good to pass up ever again. Thanks for sharing! 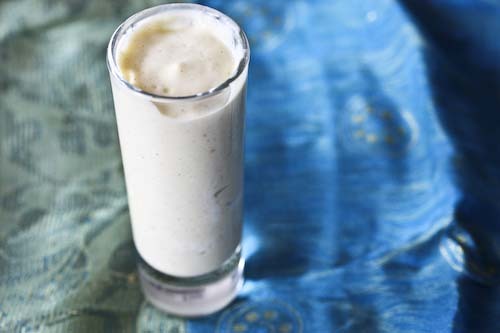 Andrea, I have never had a Lassi before, but it sure looks tasty. Love the idea of using Maple Syrup to sweeten it. Yummy! Maple and mango sound like a great combo! Wow, great job here. Awesome picture too! You should really consider submitting this to Recipe4Living's Summertime Sipper Contest! It looks delicious!